The 5th World Lagomorph Conference was held at California State University, Stanislaus in Turlock, California. Turlock is centrally located in California’s heartland, the Great Central Valley, one of the most productive agricultural landscapes in the world. The World Lagomorph Conference takes place every 4 years. This is the first time the conference was held in the United States. The previous conferences were held in Canada (Guelph, 1979), Portugal (Vairão, 2004), Mexico (Morelia, 2008), and Austria (Vienna, 2012). The World Lagomorph Conference brings together researchers on rabbits, hares, and pikas from across the world. 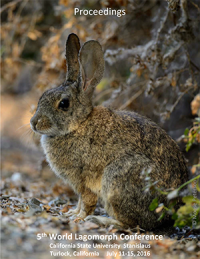 We welcome all presentations on the biology of wild lagomorphs, including but not limited to natural history, behavior, ecology, physiology, morphology, genetics, evolution, paleontology, disease, management, and conservation.